Gadsby’s Hymns, published in several stages during the first half of the 19th century, is a collection of hymns from multiple writers containing songs dating back to the 17th century. Some of the 1,156 songs in this hymnal are familiar, but most of these great lyrics have simply been forgotten in the modern church. Our primary goal for this record is to reintroduce 14 of these great hymns so believers can incorporate them into public worship again. Interestingly, William Gadsby (the original compiler of the hymnal, a great preacher and hymn-writer) was against the use of instruments in public worship. This mindset aided in making many of the original tunes and melodies unknown for these hymns. There is a companion tune book for Gadsby’s Hymns, but it wasn’t published until 1927. It is very possible that these hymns have had multiple tunes and arrangements over the years. We like to believe that our small work on these hymns is a part of something much bigger, that we are simply another group of believers falling in line with generations who have gone before us, modernizing and singing these great hymns once again. The tunes that we have applied are our way of interpreting the text in our own time and place, and it is exciting to think that the tradition of putting hymns to new music is a tradition that has gone on for many generations. We hope that you love these hymns as much as we do and that you are able to sing them again in your church. One last thing: Go buy a copy of Gadsby's Hymns. Then go buy a bunch more, and give them to all your friends. May this exceptional hymnal feed your soul the way it has fed ours. 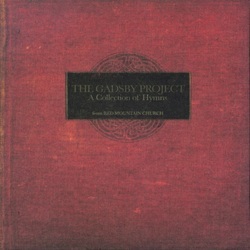 The Gadsby Project was recorded by Brian T. Murphy from August 2004 through January 2005 at Red Mountain Studios in Birmingham, Alabama. “What I find astounding is how fresh the words appear when married to contemporary music from a different culture. The style is definitely of the deep south, sometimes very country, but the music always seems to serve the words very well." “This record initially grabbed our attention because it is a compilation of hymns that we've never heard before. I'm sure that some of our readers have come across these songs in the past, but for us, The Gadsby Project had an undiscovered quality as if we, ourselves, had uncovered this treasure of material. The songs of The Gadsby Project are rich with folk-music textures. For students of popular music, the record would definitely be considered "Americana". Primarily based around the acoustic guitar, the record never strays far from the sound of strings. Drums are present, but understated, as is piano. The electric guitar of The Gadsby Project is most impressive containing that signature southern jangle that conjures such emotion." “I now bear the almost impossible task of conveying to you in just a few words how much this album has blessed, moved and spurred me on since it arrived at my house in June. The musicians from Red Mountain Church in Birmingham, Alabama have taken the Gadsby Hymnal and written new music to songs that haven't seen the light of day for centuries. The result is compelling and absolutely spellbinding. From the gentle country rock of "Pensive, Doubting Fearful Heart", to the beautifully atmospheric "Will the Lord Indeed Appear?" all the way through to the rollicking stomp-along of "It is Finished", they don't put a foot wrong. Every song is expertly arranged and many are augmented with strings, pedal steel, upright bass and the crystal clear angelic voice of Ashley Spurling. Various members take-on writing and singing duties, which means a fantastic mix of styles and moods. This is a simply exceptional, perfect piece of work. Anybody who is serious or concerned about the lyrical depth of our worship should invest in this album. Let it refresh you, edify you, and cause you to open your mouth to sing along: 'No sweeter subject can invite a sinner's heart to sing or more display the glorious right of our exalted King'."